Add easy and fast professional effects on any kind of MovieClip. 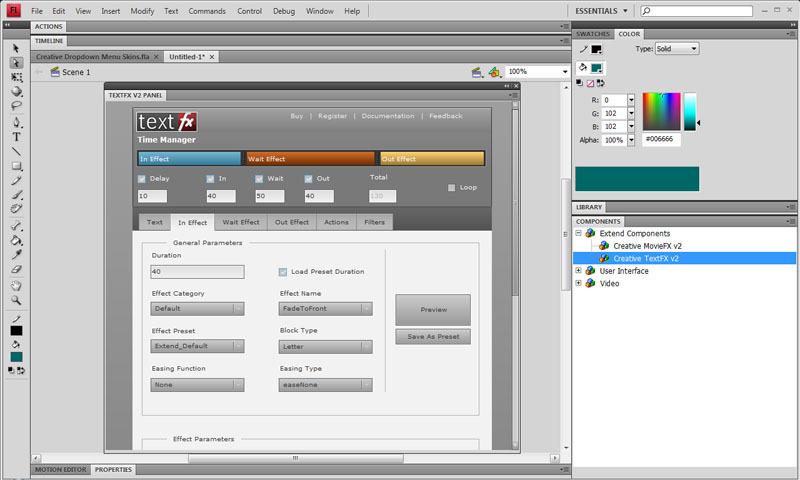 Every effect is customizable and gives endless possibilities to create and customize. Using a FLASH component has never been easier because now our components have an intuitive FLASH like interface. Creative MovieFX gives you easy access to over 70 customizable effects + gives you freedom to create visually your own custom effects = endless possibilities. ...... add the text, and choose the effect from one of the categories. Qweas is providing links to Creative MovieFX 1.0.0 as a courtesy, and makes no representations regarding Creative MovieFX or any other applications or any information related thereto. Any questions, complaints or claims regarding this application Creative MovieFX 1.0.0 must be directed to the appropriate software vendor. You may click the publisher link of Creative MovieFX on the top of this page to get more details about the vendor.